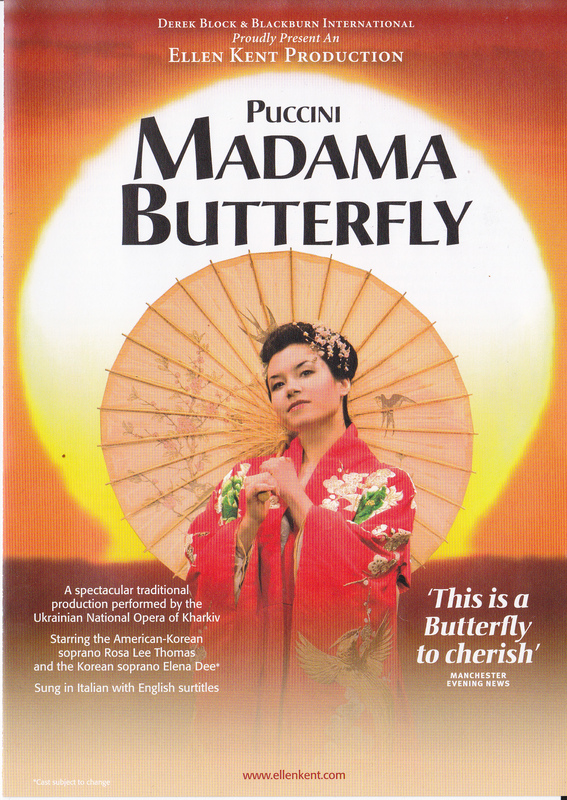 On November 26th I went to see a production of Puccini’s Madama Butterfly at the Theatre Royal in Brighton. This was my first time to see an opera as an adult, and I felt Madama Butterfly was the perfect choice for me. If I couldn’t enjoy that, then perhaps I couldn’t enjoy any opera. In 1904, a U.S. Naval officer, Pinkerton, rents a house on a hill in Nagasaki, Japan for him and his soon-to-be wife, Butterfly. Her real name is Cio-Cio San, (Cio-Cio, pronounced “Chocho”, is Japanese for Butterfly). She is a 15 year-old Japanese girl whom he is marrying for convenience, since he intends to leave her once he finds a proper American wife, and since Japanese divorce laws are very lax. The wedding is to take place at the house, and Butterfly is so excited to marry an American that earlier, she secretly converted from Shinto to Christianity. After the wedding ceremony, her uninvited uncle, a Bonze or Shinto priest, who has found out about her conversion, comes to the house, curses her and orders all the guests to leave, which they do while renouncing her. Pinkerton and Butterfly sing a love duet and prepare to spend their first night together. Three years later, Butterfly is still waiting for Pinkerton to return, as he had left shortly after their wedding. Her maid Suzuki keeps trying to convince her he is not coming back, but she will not listen to her. Goro, the marriage broker who arranged her marriage, keeps trying to marry her off again, but she won’t listen to him either. The American Consul, Sharpless, comes to the house with a letter which he has received from Pinkerton in which he is asked to break the news to Butterfly that he is coming back to Japan, but with his American wife. He begins to read it, but he cannot bring himself to finish it, because Butterfly becomes very excited to hear that Pinkerton is coming back. She reveals that she gave birth to Pinkerton’s son after he had left, but she had not told him. From the hill house, Butterfly sees Pinkerton’s ship arriving in the harbor. She and Suzuki prepare for his arrival, and then they wait. Suzuki and the child fall asleep, but Butterfly stays up all night waiting for him to arrive. Suzuki wakes up in the morning and Butterfly finally falls asleep. Sharpless and Pinkerton arrive at the house, along with Pinkerton’s new American wife, Kate. They have come because Kate has agreed to raise the child. But, as Pinkerton sees how Butterfly has decorated the house for his return, he realizes he has made a huge mistake. He admits that he is a coward and cannot face her, leaving Suzuki, Sharpless and Kate to break the news to Butterfly. Agreeing to give up her child if Pinkerton comes himself to see her, she then prays to statues of her ancestral gods, says goodbye to her son, and blindfolds him. She places a small American flag into his hands and goes behind a screen, cutting her throat with her father’s hara-kiri knife. She staggers back to the boy, kisses him and, as she dies, Pinkerton rushes in. He is too late. It is an excellent story, and the set was beautiful in a classic-Japanese way. The house was centre stage, with paper sliding doors and a small garden outside. The actors wore kimonos and carried parasols. But I couldn’t get into it. There were a few things distracting me, which certainly didn’t help with my enjoyment. One was that from our seats we couldn’t actually see the surtitles. There were a couple of screens translating the Italian words, but even if I slouched right down in my seat I couldn’t see them because of the layout of the theatre (and we weren’t in the cheapest seats). Another annoying factor was the audience. I think, sadly, the British audience has become so unrefined that they feel the need to treat theatre trips, even one to see the opera, like a trip to the cinema. The women next to me kept chatting and giggling, and digging into their noisy Maltesers. I’d like to say that was all, but I was also distracted by things on the stage. Perhaps this is unfair, but I found myself criticising the actresses for not being Japanese enough. They didn’t know how to move in a kimono; how to sit with the kimono tucked under themselves, and how to stand up gracefully. They weren’t convincing, and I think they let the performance down. I can’t fault the music or the vocal performances – not that I know anything about opera, really – but I think the performance would have been more enjoyable if I could have understood what was going on. I would have liked to have got lost in the story, but I couldn’t. Perhaps opera really isn’t my thing, but I felt convinced that if I was going to like an opera, it would have been Madama Butterfly. I watched Cars 2 last night and there’s a brilliant section in Japan. Have you seen it? No, I haven’t seen it. Where in Japan is it? They have a Japan montage including car sumo then there is a race around Tokyo. They drive across rainbow bridge and near the Imperial Palace (complete with beautiful autumn leaves). oh it is! my sister bought it for me on DVD for a xmas present. We went to Japan together in November (she had seen it before we left) and she was so excited at being able to recognise aspects of real Japan like vending machines and geisha and mistaking wasabi for pistachio ice cream.